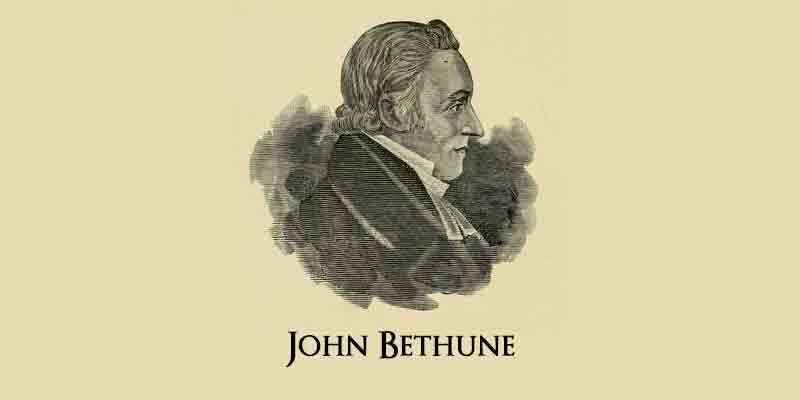 John Bethune was born in 1751 on the Isle of Skye. His father, Angus, was descended from a long line of ministers and physicians in the service of the McLeod chiefs. His mother, Christina, was the daughter of Donald Campbell, forester for the McLeods of Lewis and Katherine McDonald of the North Uist family of Baleshare. Angus had been out during the rising for Bonnie Prince Charlie. He was wounded and left for dead on the battlefield of Culloden but he recovered enough to find his way back home to Skye. John was educated at Kings College at Aberdeen and ordained as a minister of the Church of Scotland in 1772. He was one of a group of young men who petitioned the king for a grant of free land in North Carolina. The petition was denied, but all seven of the petitioners went to North Carolina on their own. John accompanied his mother, her parents, friends and family to the new land, North Carolina. John’s siblings Farquhard, Margaret, Katherine and Flora were part of the group. The family settled on McLendons Creek, west of modern day Carthage, in Moore County. He is said to have organized the Mt. Carmel Presbyterian Church in neighboring Montgomery County and was active in the Ottey Meeting Place that led to the founding of Bensalem Presbyterian Church near his home. When the King’s standard was raised in the area calling for all loyal settlers to join together to support the King, Bethune joined the group, the Royal Highland Emigrants, as their chaplain. He was with the group at the disastrous battle of Moore’s Creek Bridge on February 27, 1776, and he was captured. He endured many hardships before he was finally exchanged and was able to make his way up to Halifax, Nova Scotia. He helped organize his fellow highlanders there into the Royal Highland Emigrants and became their chaplain. After the group dissolved, John moved to Montreal where he met and married Veronique Wadden. He gathered some of his fellow countrymen together and founded the first Church of Scotland in that City. In 1787, Bethune moved to Charlottenburg in Upper Canada (Ontario) to claim his land allotment for his military service as chaplain. Always busy in Christian service, John is credited with bringing the Presbyterian Church to Ontario. His astonishing ledger of service is now preserved in Archives of Ontario in Toronto. John and Veronique had a large family: (1) Angus who joined the Hudson Bay Company; (2) Cecelia; (3) Christine; (4) Norman who was a merchant and auctioneer; (5) John who became Principal of McGill College and Dean of Montreal ; (6) James Gray; (7) Ann; (8) Neil Alexander who was the Bishop of Toronto; (9) Donald, a steamboat captain. John’s great-great-grandson Norman Bethune was idolized by the Chinese people for his work as a field surgeon on the Long Walk with Mao Zedong during the Chinese war for independence. Rev. Bethune’s manse in Williamstown is now operated as a museum, a fitting tribute to his long life of service. He died on September 23, 1815, at Williamstown, Ontario. © 2019 The Argyll Colony Plus. All rights reserved.